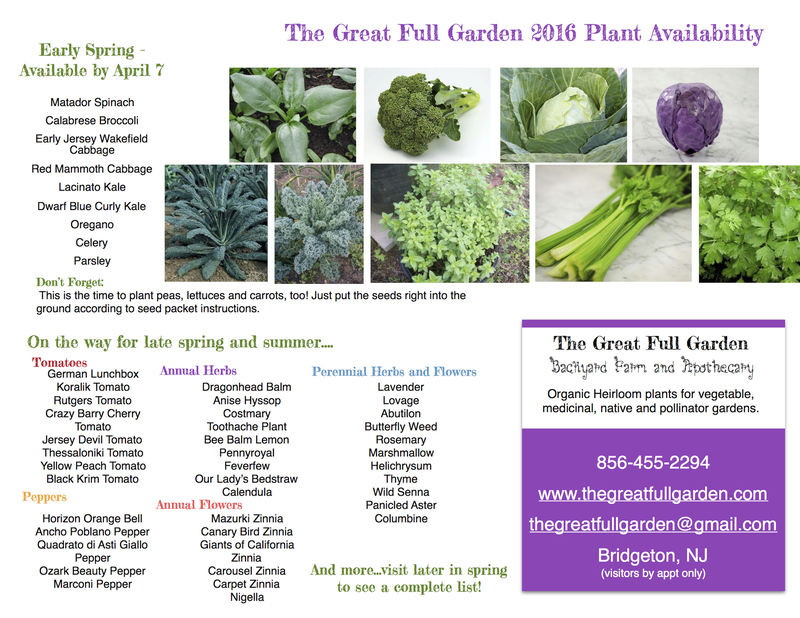 Check it out~~ Plant availability for 2016 is up! Before the end of tonight I’ll also have the Event Schedule where you can buy all these goodies. If you’re not the event-going type, no worries. 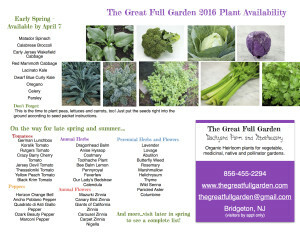 Get in touch at thegreatfullgarden@gmail.com or 856-455-2294 and set up an appointment for pickup 🙂 $50 or more worth of plants gets you free delivery! Lastly, this is ONLY THE BEGINNING. Check back in late spring for more. 🙂 Happy Planting! This entry was posted in Uncategorized by Jamie Warner. Bookmark the permalink. I have a lot of pots for you. Where are you located. Also, do you sell any plugs ? Hi Carol, thanks for contacting me about the pots! I am located in Bridgeton, I don’t sell plugs, but i do sell 4 and 6 packs of plants. Let me know what you’re interested in. I’m going to email you off this page with my address, if Bridgeton is too far, we can meet up!